When it comes to meal kits, the biggest point of contention is almost always price. People often assume that meal kits are more expensive than picking up groceries and cooking your own recipes. To get a clear understanding of meal kit vs grocery store pricing we’re going to conduct a little experiment today. We’ll be randomly choosing meals from the top 7 most popular meal delivery services and comparing their ingredients to the same ingredients found in the grocery store. To keep things consistent, we will use the most expensive per serving/meal cost we can locate on the meal delivery service website. And since each dinner the meal kit service sends serves 2 people, we will double the per serving cost to give us the price to compare to the grocery store ingredients. Also, since grocery stores around the United States all charge different prices for different foods, we’ll be using Fresh Direct instead of our local grocery store. I’ll be picking the highest-quality ingredients from the grocery store possible to compare the meal kit version. This includes organic, when possible. Why? Because high-quality ingredients are a major selling point of all of the popular meal kits currently on the market. I will also find the smallest quantity available you can purchase via Fresh Direct for each ingredient since we’re only comparing using one serving for the price. You’re probably most familiar with Blue Apron as a meal kit due to how often they advertise and the fact that they are one of the few publicly traded meal delivery services on the market. View our full Blue Apron review here. Hello Fresh, like Blue Apron is also one of the most well-known meal delivery services around. And while similar to Blue Apron, we found their recipes slightly more unique. View our full Hello Fresh review here. View our full Home Chef review here. Sun Basket is a meal delivery service that’s known for their variety of speciality meal plans (e.g. paleo, gluten-free, vegetarian, vegan, and more). View our full Sun Basket review here. Plated got its start on the well-known show, Shark Tank. Since then, they’ve exploded in popularity. In 2017, they were purchased by the national grocery chain Albertsons. View our full Plated review here. Marley Spoon is the lesser-known meal delivery service backed by the super-homemaker, Martha Stewart. They market themselves as the meal delivery service that allows you to cook recipes from Martha herself. View our full Marley Spoon review here. Green Chef is a meal delivery service known for their wide variety of niche meal plans. From vegan and vegetarian to keto and paleo, they have something for almost every diet. View our full Green Chef review here. Did the price comparison surprise you? 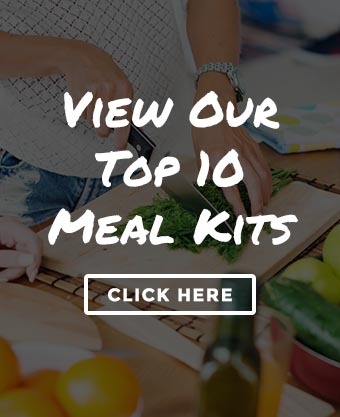 Many people assume that meal kits are much more expensive than actually going to the grocery store, picking up the ingredients, and making it yourself. As you can see, this is a myth. In fact, in every single comparison between a meal delivery service and the grocery store, the meal kit was always cheaper. Keep in mind that we didn’t even factor in gas/maintenance costs on your car and the time that it takes to go to the grocery store, find ingredients, wait in line, pay, drive home, and put everything away. If we did, the grocery store prices would be even more expensive. Yes, I know this comparison isn’t perfect. We’re comparing single-use ingredients (via the meal kits) to full-sized products (via the grocery store). The thought-process behind writing this article is to show people that if they were to use the same recipe that the meal delivery service sends, it would cost significantly more to buy all the ingredients at the grocery store than the meal delivery service would charge them. It’s not possible to buy only single-use ingredients at the grocery store or else the price comparison would be much closer. Beyond the price factor, meal kits allow you to explore new dishes without being stuck with random ingredients you’ll likely never use (for example, “samal oelek” from the Blue Apron recipe). Their goal is to make cooking less of a chore and more of an experience you actually look forward to. This is surprising…. I’m interested to know how much it would cost if you actually priced out just the specific servings and not the cost to buy the whole ingredient from the grocery store. It seems like the meal delivery business might actually still be cheaper. Because they can negotiate better rates with the food suppliers and buy in bulk? Just a thought. OK but considering that I walk to the grocery store (it is 2 blocks from my home) I actually can save more. Yes I do have to carry a lot of grocery bags but I try to go once every 2 or 3 days so that I buy less. I do see how these types of services can help because it is hard to find smaller servings at the store. I would try one box to see first.